If you’re approaching the end of on OKR cycle, it may be time to refresh on how to grade them. Grading OKRs is an opportunity to reflect on accomplishments and what might be done differently the next time around. Low scores force a reassessment, while high scores provide empirical proof of delivery. If you’re using OKR software like BetterWorks or Lattice, OKR scores will be system generated for you. If you’re not, you’ll have to do some math. But, no matter how you calculate your score, it’s good to understand the meaning behind the numbers and where they come from. This is the basic “yes/no” of OKRs. There is also a more advanced way to score each key result on a scale. “0” equates to failure and “1.0” means the objective was completely achieved. 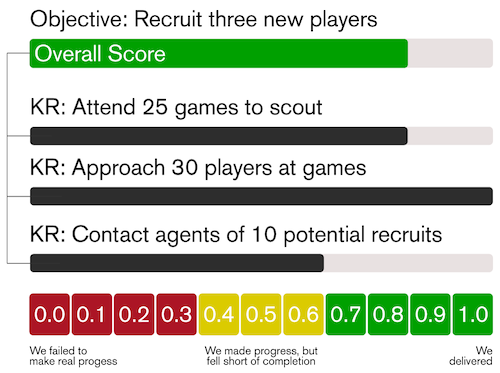 Within these metrics, each individual key result is graded and averaged to score the objective. You could only get to 20 games so that’s 0.8, an admirable score. You approached 30 players, so that’s a perfect 1.0. You were only able to get ahold of 6 agents for 0.6, a borderline green. Altogether, the average is 80%—or a raw score of 0.8, a passing grade. However, OKRs go beyond this and require self-assessment, too. In analyzing OKR performance, objective data should be looked at subjectively, also, because, for any goal, there may be extenuating circumstances. One final thing worth noting is that you want to see variation in your key results. As stated earlier, 70% is a good score. If everything is 100% or 30%, that kind of homogeneity is suspicious. It may mean that you need to set stretch goals or completely rethink your OKRs. The answer is in the numbers. Have you graded your OKRs recently? We’d love to hear what they were and how they went so please let us know. And, if you’re looking for more OKR information, you can find other FAQs, Resources, and Stories right here on WhatMatters.com.